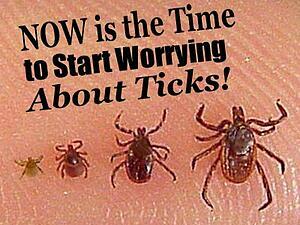 Now is the Time to Start Worrying About Ticks! "Celebrating Over 40 Years of Exceeding Customer Expectations!" "You'll love doing business with Giroud... Guaranteed!" While some bugs are just annoying, others can pose serious risks, and ticks are at the top of the list. Ticks carry a variety of diseases that can harm you, your family and your pets. But should we be worried about ticks so early in spring? YES! Read on to find out why, and to learn what actions you can take to protect your property from dangerous ticks and the illnesses they can carry. Ticks carry a variety of diseases that can cause some pretty awful symptoms and side effects. Lyme Disease, Powassan Virus, Alpha-Gal Syndrome and Rocky Mountain Spotted Fever are some of the worst for humans and pets. To learn more about these, check out Giroud's post about a CDC Report that Mosquito and Tick Borne Illnesses Have Tripled! We tend to think about ticks in the heat of the summer, but ticks are actually hardy little insects! They will go into hiding once the temperature dips below freezing, but once it's consistently above that 32 degree mark, they are back out and ready for action! That means ticks are out and about NOW in Pennsylvania! Fortunately, there are many actions you can take to protect your property from dangerous ticks and the illnesses they can carry. 1. Clean Up Your Yard: Ticks are shade lovers and can’t survive in the sun! Cleaning up your overgrown vegetation will give ticks fewer places to congregate. Additionally,pruning tree branches and shrubs around the lawn edge will let in more sunlight. Also, mow your lawn regularly because as HGTV's website explains: "Mowing the grass decreases tick “questing,” which is the way they stalk their prey…meaning you. It also increases the temperature, meaning fewer cool clumps of tall grass to hide in, and ticks don’t like the heat." 2. Choose plants that deter ticks: Use your garden to your advantage! Ticks are deterred by mint, lavender, rosemary, marigolds and citronella grass. An added bonus is that mosquitoes and fleas also hate these strong smelling plants, so start planting! 3. Keep Deer Off Your Property: Deer are the primary carrier of ticks through the yard. Use Deer Repellent treatments to deter deer from feeding on valuable plants and carrying ticks into your yard. You can go a step further and check the landscape to identify and remove plants that are attracting deer to the yard. HGTV provides a list of plants that are repellent to deer. 4. Tick Control Treatments: Giroud offers both 100% organic and traditional chemical based treatments to control ticks. A Giroud Expert will assess your property for tick "Hot Spots" and suggest a treatment plan to attack ticks where they gather. They'll treat around the perimeter of the property and other high-risk areas where ticks are likely to live. Check for ticks after outdoor activities: Even with tick control in the yard, it's still important to check family members and pets after any outdoor excursion. Bathe or shower as soon as possible after coming indoors. Conduct a full-body tick check using a hand-held or full-length mirror. Parents should check children for ticks under the arms, in and around the ears, inside the belly button, behind the knees, between the legs, around the waist, and especially in the hair. Examine gear and pets. Ticks can ride into the home on clothing and pets, then attach to a person later, so carefully examine pets, coats, and day packs. After removing the tick, thoroughly clean the bite area and your hands with rubbing alcohol, an iodine scrub, or soap and water. Dispose of a live tick by submersing it in alcohol, placing it in a sealed bag/container, wrapping it tightly with tape, or flushing it down the toilet. Never crush a tick with your fingers. The illnesses and diseases caused by these bloodthirsty insects can be damaging for life. Protect yourself and your loved ones now. 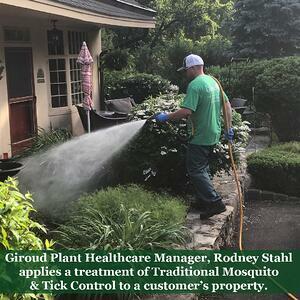 Call 215-682-7704 to schedule your FREE Evaluation with a Giroud Tick Expert! "To make our clients love doing business with us and make a difference in the lives of our co-workers and community by upholding our core values of Honesty, Caring, and "Doing the Right Thing...No Matter What."